why is he holding his shoe? 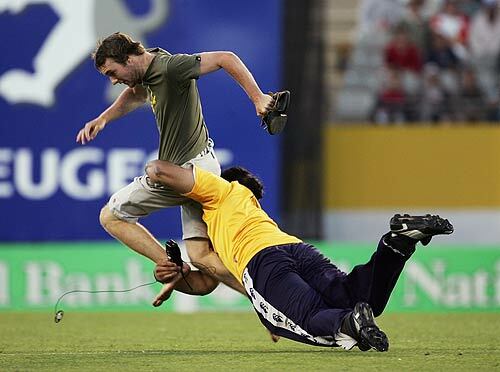 A stunt to help the tackler make it into the NZ rugby side ? Hope Graham Henry was watching lol. -The story in a nutshell is three college dorm students who seek ultimate highs by purchasing and using a bong that is possessed by an evil spirit. It was at this moment the invader was glad Tana Umaga and Keven Mealamu weren't on the security staff. He's going to hit the dirt pretty hard. Early trials of Ipod's new security measures proved a resounding success, with a would-be thief caught trying to download illegally onto a MP3 player that looked like a pair of shoes. The new system is triggered after someone tries to download 2 or more songs without paying, the third file is then automatically converted from wav/MP3 to a rather large, muscle-bound security type who beats the offender to a pulp...called 'Nosebleed Version 1.0' it's expected to be a big hit with bands and managers over the Christmas period. Classic and totaly out of the blue. And Brian Lima or any Samoan for that matter. Just ask a certain South African in the 2003 WC. It was only with some persuasion that the offender agreed to have a tracking device "inserted" into his heel. "Please don't leave your the only fan we have"